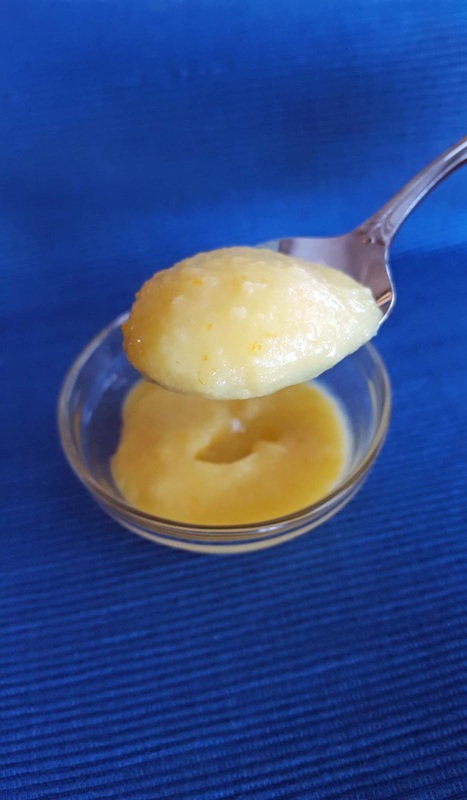 Orange, or any fruit curd is a creamy spread or topping made with butter, eggs, sugar, citrus juice and zest. It's not a jam or preserve. It looks like a pudding, but it doesn't taste like one. 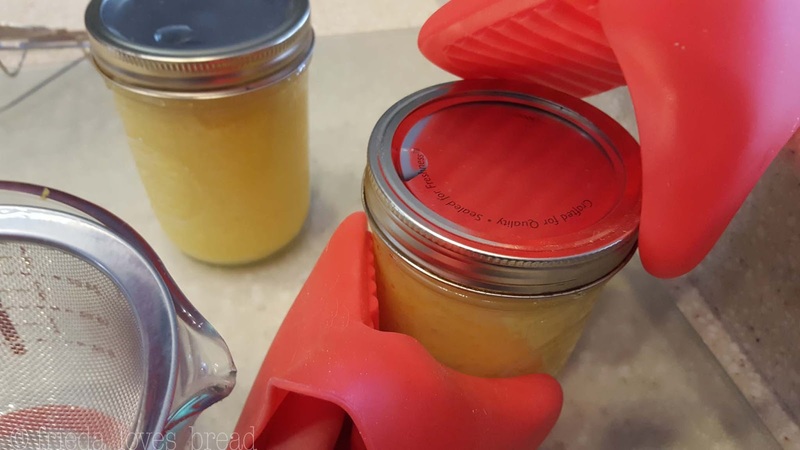 Curd has more juice and zest, for a more intense flavor. Other than dipping a spoon into a large jar of citrusy curd and savoring it by the spoonful, where else would you use curd? Use it on bread or scones, as an alternative for jams. You can find curd in cake fillings, pastries and small tarts. Spread it on top of a cheesecake. Try it with toast, waffles, biscuits, pancakes, or muffins. You can even mix curd with whipping cream for a mousse-like filling for cream puffs. Hurry, make this right now!! 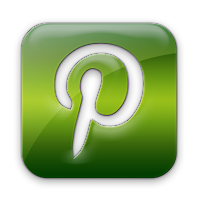 You can make this on the stove top (directions at the bottom of this post) or use your pressure cooker. Using a pressure cooker will allow you to walk away from it, instead of stirring it constantly on the stove. 1. Roll a clean, washed orange on a flat surface, pushing it as you roll it. 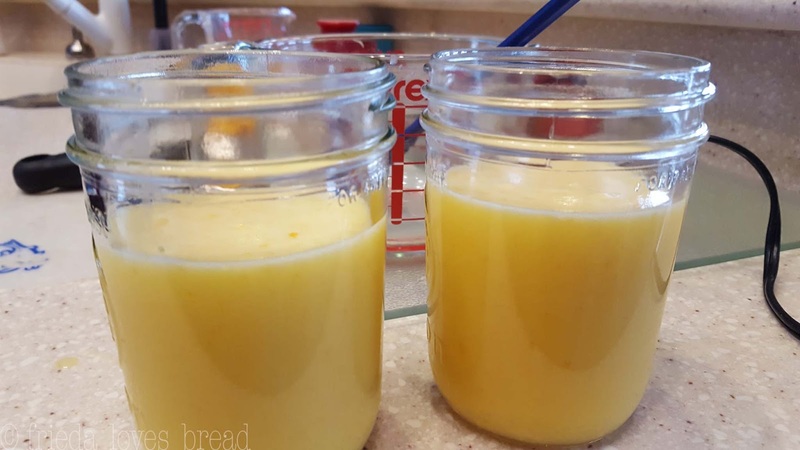 This breaks the membranes inside the orange and helps release more juice. 2. Using a citrus zester, grate the skin of the orange, being careful not to scrape off the bitter white pith under the orange skin. 3. Set a fine mesh strainer over a bowl or large measuring cup. Cut the orange in half and using a citrus reamer, squeeze and rotate the orange, releasing the pulp and juice. Push the pulp through the sieve with a large spoon or silicone spatula. 4. 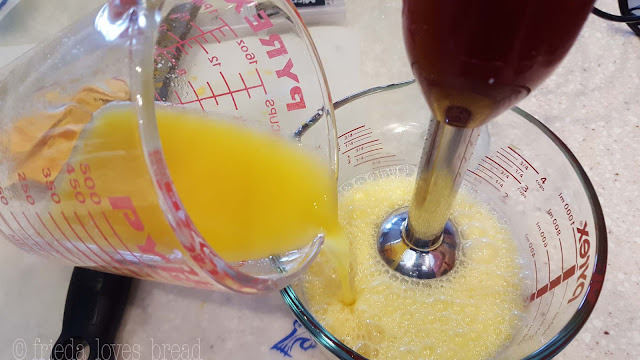 In a medium 1.5 quart oven safe bowl, or large 4 cup measure, whisk the eggs and yolks till smooth. Whisk in sugar, orange peel, and melted butter. You can use an immersion blender for this step. 5. Divide between 2 wide mouth pint canning jars. If you use canning jars, place the lid and ring onto the jar, and turn the lid finger tip tight. This means to screw the lid on just till you start to feel resistance when you tighten. if you are using the bowl to mix/pressure cook your curd, cover the bowl with aluminum foil, crimp it at the rim, and set it on an 18"-20" long piece of aluminum foil that is folded into a 3" wide strip to use as a lifter to place it in/out of the pressure cooker. I really like this method, as it saves me another dish to clean and the risk of it overflowing into your pressure cooker is very low. I save and re-use the foil strip. 6. Put 2 cups of water into the pressure cooker liner, include the wire trivet, and place the 2 jars of curd (or aluminum covered bowl of curd) on top of the trivet. Close/lock the pressure cooker, set the valve to sealing/closed, and select HIGH pressure for 9 minutes. 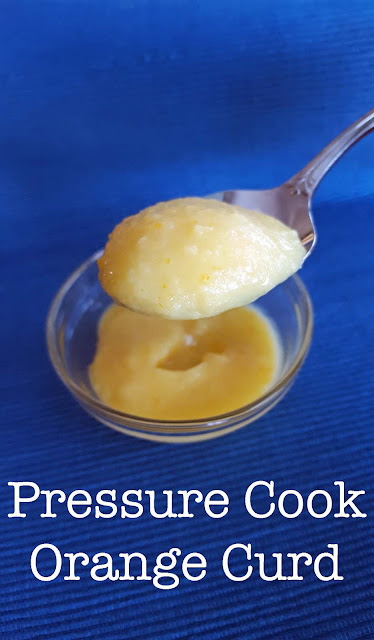 When the pressure cooker beeps, allow the pressure to naturally release for 10 minutes. At the end of 10 minutes, open the pressure valve to release the rest of the pressure. 7. 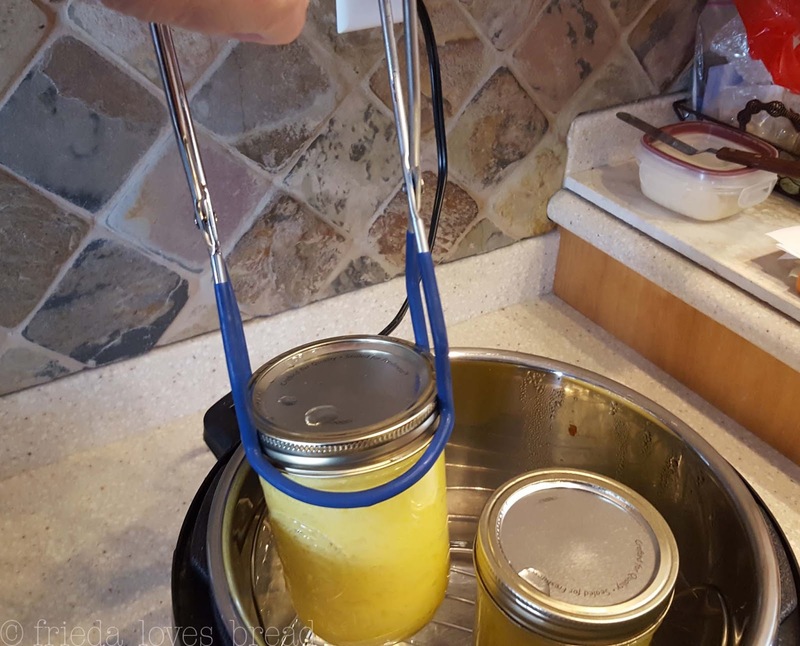 Using a canning jar lifter, carefully remove the hot jars and set on a wire cooling rack. 8. Using hot pads, carefully remove the ring and lid. Stir the curd well. If you want, you can push the curd through a fine mesh strainer. Doing this will help create a very smooth texture and remove most of the orange zest. 9. Allow the curd to cool at room temperature for 30 minutes. Put the cooled curd in the fridge for at least 4-6 hours to set. Finished curd will keep in the fridge for up to one month. A decadent fruit based custard that is perfect stirred into yogurt, spread onto toast, waffles, used a cake fillings or in tarts or pastries. 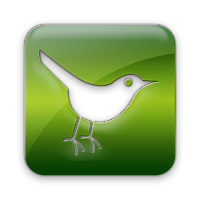 Use the larger range of sugar when substituting key lime or lemon juice. 1. Roll the oranges on a flat surface to release more juice.2. Using a zester or fine grater, grate the orange skin, being careful not to remove the bitter, white pith.3. Set a fine mesh strainer over a bowl or 2 cup measuring cup, to catch the pulp and seeds.4. Cut the oranges in half, and using a citrus reamer, juice the oranges over the strainer.5. 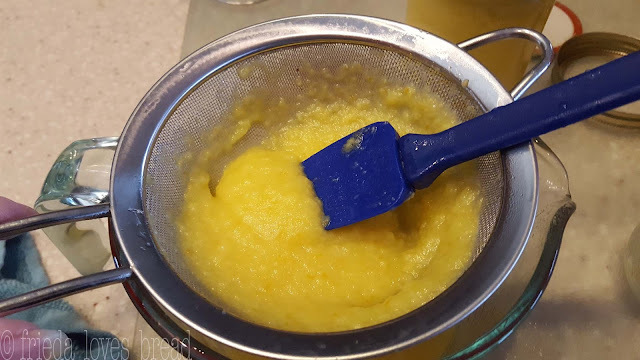 Using the back of a spoon, push the juice from the pulp through the strainer.6. In a medium bowl, whisk the eggs and yolks, till smooth. Add melted butter, stir well. 7. 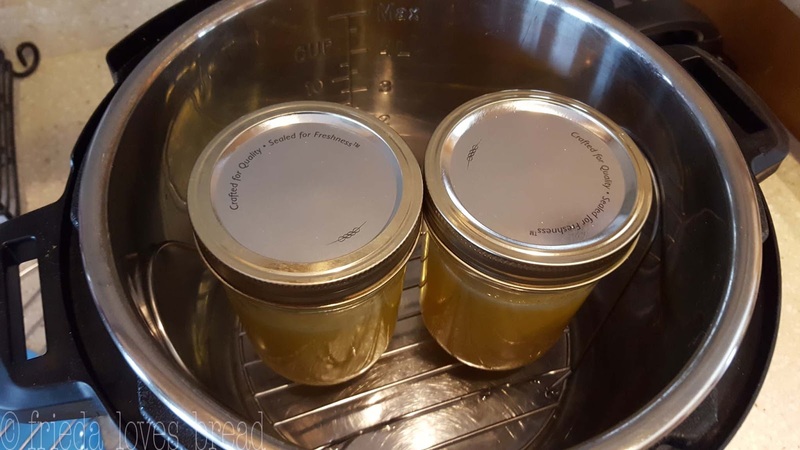 Pour the curd into an oven safe bowl, or into 2 pint sized canning jars, making sure they are not more than half full.8. Cover the oven safe bowl with aluminum foil or place lids on jars, with the rings "finger tip tight."9. Put 2 cups water in the pressure cooker. Place trivet or wire rack in cooker.10. Put covered jars of curd on the trivet. If using a bowl, create a folded foil sling, 18" long and set that on the trivet, then place the covered bowl on the trivet.11. Close the lid and pressure valve.12. Select HIGH pressure, and cook time for 9 minutes.13. When cook time ends, use a 10 minute natural pressure release. 14. After 10 minutes, open the pressure valve and release any remaining pressure.15. Using hot pads or the foil sling, remove the jars/bowl of curd and place on a wire cooling rack.16. Using hot pads, carefully open the jars or remove the aluminum foil.17. Stir the curd well. 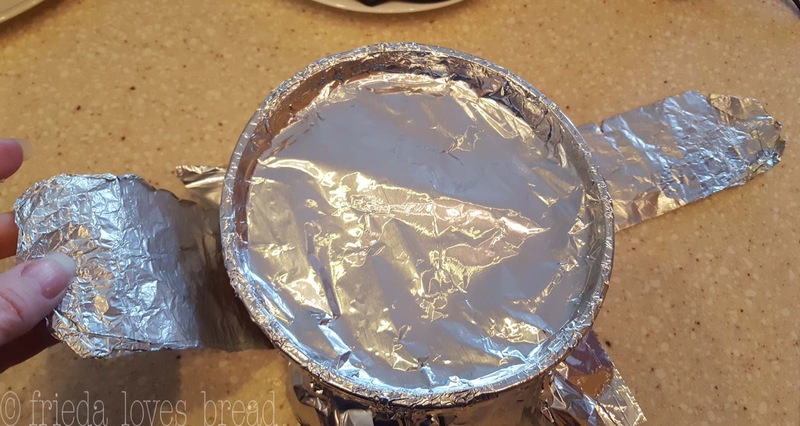 Place foil/lids/rings back on and allow to cool at room temperature for 30 minutes.18. If you wish, you can push the hot curd through a fine mesh strainer to create a smooth textured curd.Place cooled curd in the fridge to set to at least 4-6 hours. Curd will keep well in the fridge for up to one month. You can freeze your curd in freezer safe containers for up to one year. 1. Roll the oranges on a flat surface to release more juice.2. 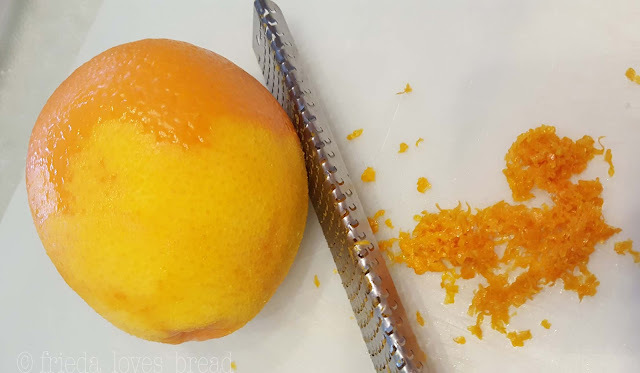 Using a zester or fine grater, grate the orange skin, being careful not to remove the bitter, white pith.3. Set a fine mesh strainer over a bowl or 2 cup measuring cup, to catch the pulp and seeds.4. 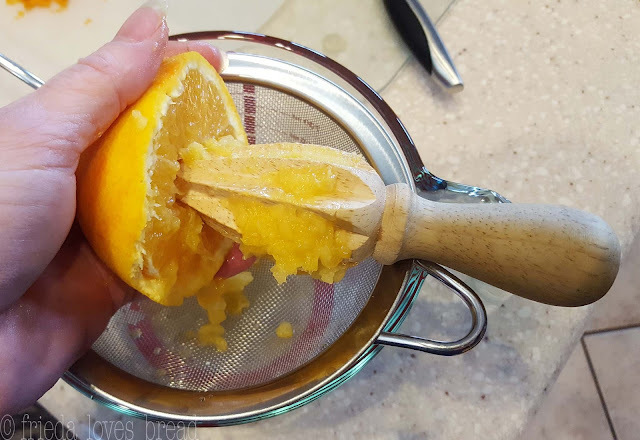 Cut the oranges in half, and using a citrus reamer, juice the oranges over the strainer.5. Using the back of a spoon, push the juice from the pulp through the strainer.6. In a saucepan, whisk the eggs and egg yolks with the sugar.7. Add zest, orange juice to the sugar mixture and whisk till combined well.8. Set saucepan over medium heat, cooking slowly till the curd is thick enough to coat the back of a spoon, stirring constantly. 9. Remove the pan from heat and whisk in your cold butter, one tablespoon at a time, till you end up with a thick and smooth curd.10. Leave the curd to cool at room temperature in the pot, pour into clean jars and store in the fridge for up to one month. Can put cooled curd in freezer safe containers and store for up to one year.